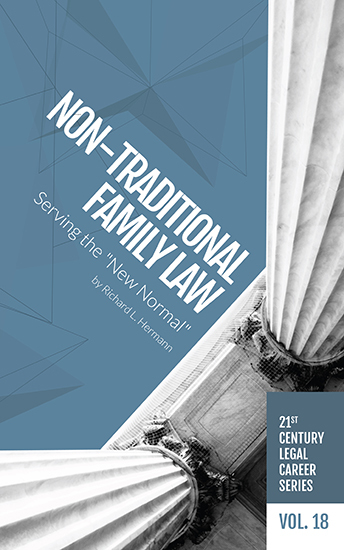 Volume 18, Non-Traditional Family Law: Serving the “New Normal,” examines the dramatic changes family law practice —the definition of which now encompasses a wide range of domestic arrangements —has undergone. In the past 30 years, rapidly changing social norms and dramatic technological advances have revolutionized family law. As more attorneys enter the field and the practice becomes more complex, demand increases for lawyers with greater family law expertise. It is the nature of the family served by the law—and the opportunity it presents in terms of millions of potential new clients requiring family law services—more than the nature of the practice itself (although there are certainly elements of that), which has changed. In this volume, Hermann illuminates a field, which offers law graduates a vibrant practice option comprising new legal frontiers while retaining its primary focus on domestic relations matters. Buy the print edition at the NALP bookstore or the electronic version .